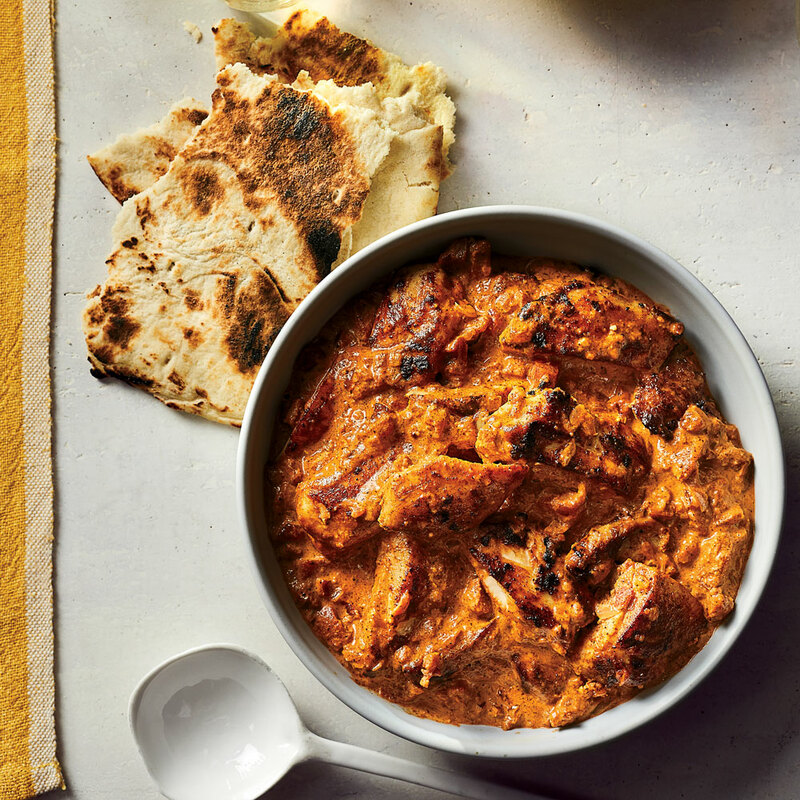 In 2018, Food & Wine named this recipe one of our 40 best: Big-flavored, creamy, and comforting, chicken tikka masala is the perfect gateway dish to Indian cooking. This version, from former F&W Senior Test Kitchen Associate Grace Parisi, is relatively easy to prepare— and highly addictive, thanks to the slightly spicy tomato cream sauce. (For many years, this was the most popular recipe on foodandwine.com!) The chicken does need to marinate overnight, so plan accordingly. Meanwhile, in a small skillet, heat 1 teaspoon of the oil. Add the almonds and cook over moderate heat, stirring constantly, until golden, about 5 minutes. Transfer the almonds to a plate and let cool completely. In a food processor, pulse the almonds until finely ground. In a large enameled cast-iron casserole, heat the remaining 2 tablespoons of oil until shimmering. Add the onion, garlic and ginger and cook over moderate heat, stirring occasionally, until tender and golden, about 8 minutes. Add the garam masala, chile powder and cayenne and cook, stirring, for 1 minute. Add the tomatoes with their juices and the sugar and season with salt and pepper. Cover partially and cook over moderate heat, stirring occasionally, until the sauce is slightly thickened, about 20 minutes. Add the cream and ground almonds and cook over low heat, stirring occasionally, until thickened, about 10 minutes longer. Stir in the chicken; simmer gently for 10 minutes, stirring frequently, and serve. The Chicken Tikka Masala can be refrigerated for up to 3 days. Reheat gently before serving. Variation The marinade and sauce here are also delicious with shrimp, lamb and vegetables. Steamed basmati rice, rice pilaf or warm nan.